Vegan Blueberry Cheesecake. Just because you are vegan, does not mean you need to miss out on cheesecake. Cashews serve as a wonderful replacement for cheese in this Vegan and Gluten Free Blueberry Cheesecake. I made a 6 inch round cheesecake, but you can also do mini cheesecake bites if you prefer. This healthy dessert makes the perfect use of those blueberries. If you are not a fan of blueberries, you can use another berry if you like. Or even a combination of berries. 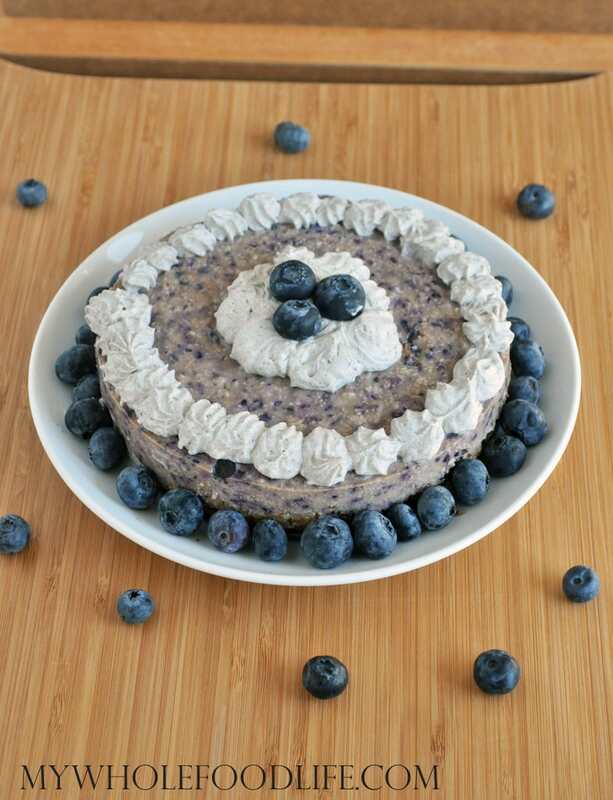 This vegan blueberry cheesecake is not only vegan, but also gluten free and grain free. There is no cooking required, so it makes a great dessert for this hot weather. If you are a visual person, I filmed a video for this recipe as well. You can view it below. For more videos, you can subscribe to my You Tube Channel. In a food processor , combine almonds and dates. Slowly add a little water at a time until the mixture starts to clump together. Grease a 6 inch spring-form pan . Press the crust mixture into the bottom of the pan evenly. Place the pan in the fridge while you make the cheesecake part. In a food processor , combine all the cheesecake ingredients. Blend until smooth. Pour the cheesecake mixture into the pan and place in the fridge to set. About 6 hours. Sticking it in the freezer can speed up the process if you are in a hurry. Once the cheesecake has set, make the cream topping. Open the can of coconut milk. Scoop out the fatty white part into a mixing bowl with the maple syrup and vanilla beans. Save the water left for smoothies. Using the whipping attachment , whip into a cream. Place the cream in a pastry bag and pipe the frosting on. Place back in the fridge for another 30 minutes. Enjoy! What a beautiful recipe! Blueberries are my all-time favorite fruit. I'm convinced you almost can't go wrong no matter how you include them in a recipe:) Thanks for sharing! There should be a setting to print just the recipe. If you can't find it, can you take a screenshot only of the recipe? My medjool dates gets a crusty stuff on them. Like when I blend them, there are hard pieces flying around the vitamix. How can I avoid this? How do you store yours? I want to make this, but no crust stuff. I have never seen that happen before and I buy a lot of dates haha! I store mine in the fridge. I really need to make this! Like- yesterday!